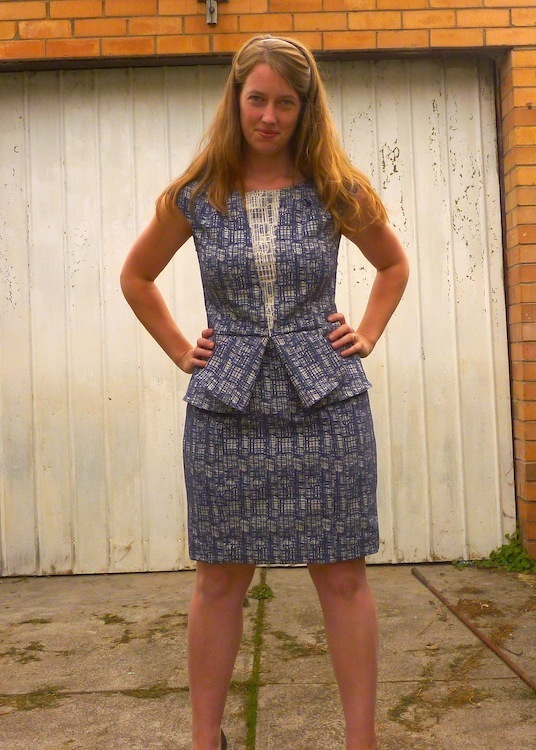 A sewing challenge for all sewists, using the same fabric, to create out own outfits? Challenge accepted tessuti. Challenge accepted. (see here if you want to know more of about the challenge, and here to see some entries). The fabric didn’t feel anything like I first expected, and it had more stretch and drape and was warmer to boot. As this was intended to be an ‘experimental’ project for me, I wanted to try a new style, a new pattern company and heck, let’s try some new measurements while we’re at it right? I’d read about the kind of creepy yet awesome site www.upcloud.com which takes your measurements via your webcam. This is free and AWESOME. nice to get some validation that my self measuring isn’t too off. I’d like to think I’m self-confident enough to not fib about my measurements, but who doesn’t give themselves a centimetre of two of leave? The new (to me) pattern company was Lekala patterns, and the specific pattern was ‘dress with Basque 4189’. So earlier when I said I might fib about my measurements? Here’s the interesting thing. When completing the measurements for the Lekala website for my pattern, I didn’t believe the waist measurement that Upcloud had given me. So I added an extra 4cm. For cupcakes and the like. 4 extra centimetres is a HUGE differential. And as such, when I made up my muslin the waist was too big. By 4 centimetres. GAAAAH. And so much trimming and adjusting was done. Next time, I’ll trust the pattern. The skirt is 7 pieces, 4 for the peplum and 5 for the bodice. It still came together pretty quickly, even after adding another 11 pieces for the full lining I added. The lining was a light cotton batiste I thought, but after an incident with an overly hot iron I can confirm that it is in fact some unnatural fibre (clearly pulled the wrong fabric from the stash), but I’m happy with it. Using a bright white was important as the lining was going to help make the cream sections “pop” more. The fabric was so thick that the seams should have all been graded, however the included seam allowances on Lekala patterns is a scant .5cm which left insufficient for grading. All the neckline and armholes are prickstitched down to keep the lining from peeking out. 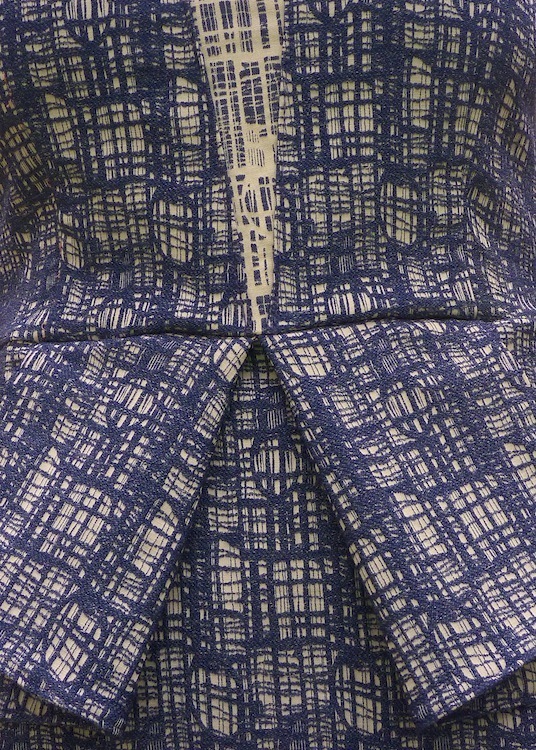 The hem was catchstitched by hand for an invisible finish. It would have fit beautifully from the first go if I had put my measurements in right. *sigh* The only other alteration was to reshape the skirt and make it more of a pencil skirt and taper in a little towards the hem. 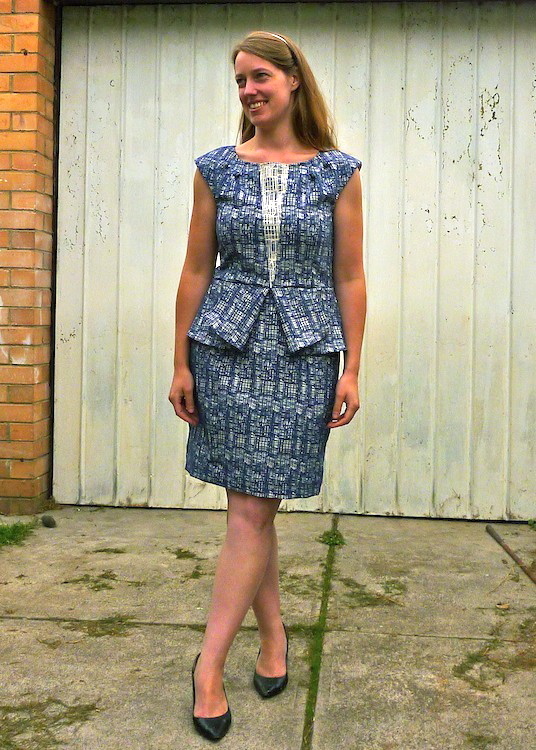 Prick-stitching, catch-stitching, and really I should have tried a waist-stay to help support the weight of the peplum. The only grosgrain ribbon on hand however was covered in my little pony pictures. Honestly, the problems I have. I will use Lekala patterns again, their styles are a weird mix of Cue style dresses (an edgy Australian brand), gypsy blouses and wedding dresses. The fact is though, I didn’t have to do a FBA and it fit perfectly through the shoulders. I’m intrigued to try more. They are PDFs, but that work ok for me for the slim pattern pieces are easy to assemble and fold. All and all, I love this dress. And it’s pretty good for playing peekaboo in! Make sure you go and check out the other entries on Pinterest, it’s such good inspiration! This little cord dress was for my darling little cousin for Christmas. It was meant to be a simple make, but a few things threw it out. The pattern was out of the Japanese pattern book, girls style book. I believe this was dress W or maybe T, but the instructions were tricky to find, as although the patterns were all designated by letters in the alphabet…the instructions were not in alphabetical order. There was some well chosen language trying to find the instructions. I’m not completely in love with this make as I did a shocking job of it. Next time, I will plan appropriately and master the cord. Ahhh, I’ve not seen it on the most lovely recipient, and I hope it fits. 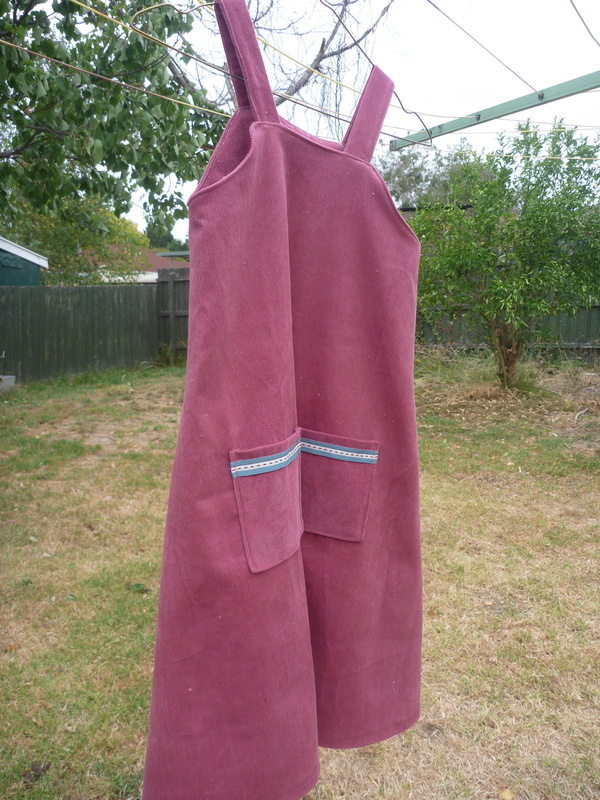 If it does it could be a nice little stashbuster as winter pinafores with tights. For a Japanese style book, I anticipate these being better fitting for slimmer children, which so far would not be the case. Most of the styles are very loose fitting, which was not what I intended when making an impulse buy. I was seeking patterns to fit skinny tall kids – and this is not the answer. 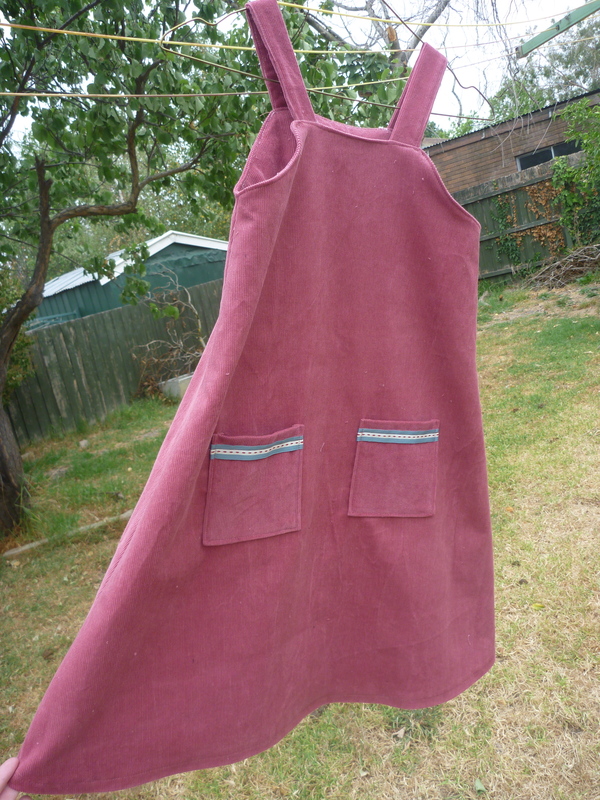 This pink cord was $9.95 a metre from the Cloth Shop in Ivanhoe. It’s a very thin cord, and lovely. Let’s get this out of the way. I rushed this project. Big time. I cut out every piece from one metre. But wait…where’s the back of the dress? That’s right. I left off the second largest pattern piece from my layout and did not notice. Don’t worry, I did cut out an extra piece, in case I ever need a jacket front facing for the matching coat (for one side). There was epic drama trying to get an extra metre to finish this dress, and due to Christmas opening hours being poorly advertised, this didn’t get finished until January. This was a really tricky make, as I didn’t bother thinking/reading about sewing with cord. My seam finishes are horrible as the serger would not play nicely with the cord, pinking just got pink fluff everywhere, and using three different methods on the same seam does not look nice. I’m really disappointed with the insides of this garment, and it is entirely possible the nap on the front and the back are different. On an upside, following the instructions in this book is great. Like Cake Patterns, the sewing process is designated by numbers, so you can do a quick check of the order of assembly. Fab for instruction skippers like myself. Do not be a stupidhead but out pattern pieces before laying them all out. Do not forget that cord has nap. Do not do such ugly seam finishes. Do not start christmas dresses a week before christmas, when the fabric store might be shut, and all your rushing is going to cost you more time. Oh, and nothing in this book is going to fit my little one for a very long time, which means if I start all of them now…they might be finished by the time she grows into them. 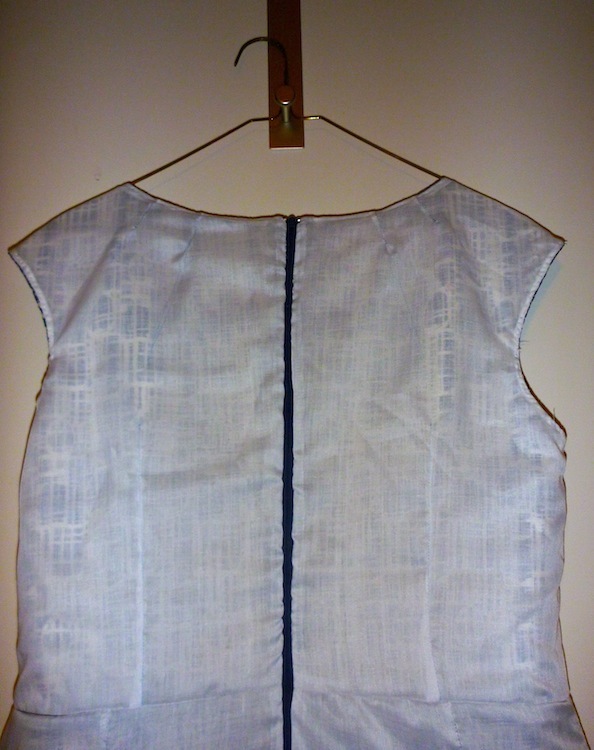 After making the washi dress muslin, I could tell this was going to be a dress to live in for a hot Australian summer. The fabric choices were overwhelming me, too many fabrics and too much choice! I lost my sewjo. The cure? I laid out the fabrics and made my husband pick. What do you think of his choice? It’s a little shorter, a little flirtier and is my new go to summer dress. This fabric doesn’t really support the pockets very well. 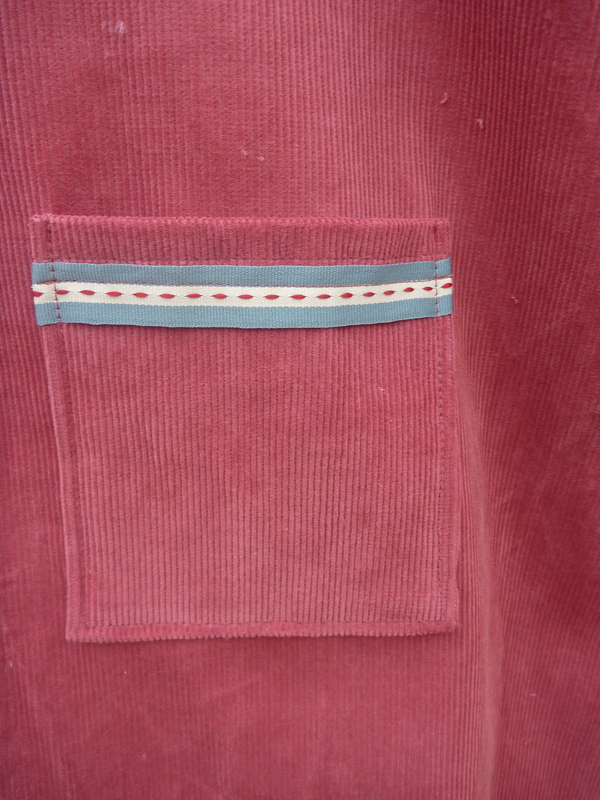 I prefer adding pockets rather than cutting from the one piece, it allows for topstitching the pockets down. 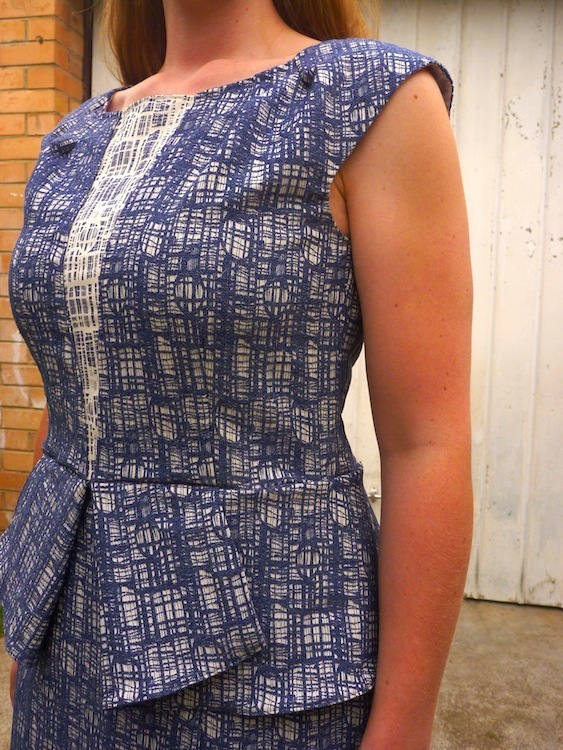 This one is constructed as the other one except in how I constructed the neckline. I followed the grainline tutorial to try a different way to finish the neckline. This was another random stash fabric my Nana gave me. Awesome right? I have no idea what it is, but it’s all bumpy and textured and kinda fun. The shirring was less successful on this one, after shirring the back piece, I didn’t use an appropriate stitch length and two lines (out of 6) ‘popped’ out of the side seams. Meh, it’s still comfortable and I’ll wait until it breaks more to fix it. Lazy? Yes. Broken? No. The grainline studio tutorial I used was this to use bias tape to get a folded flat finish underneath. 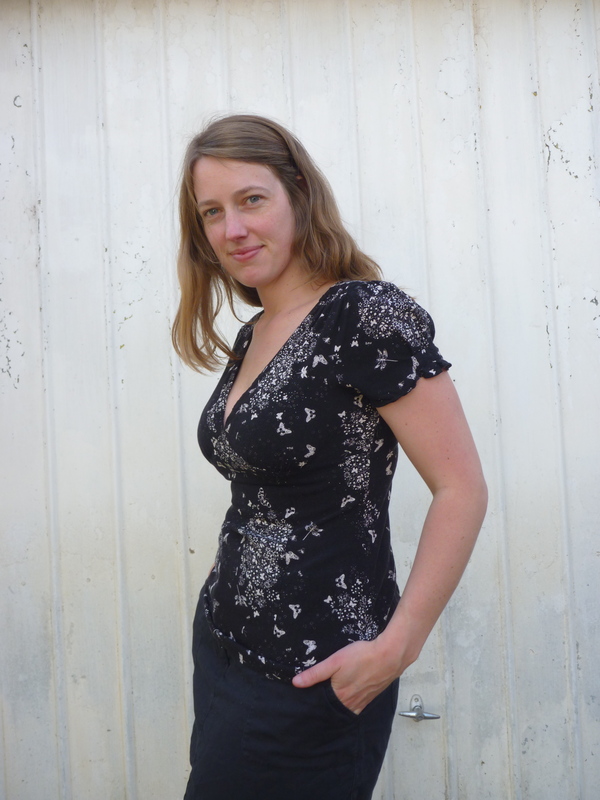 It mostly worked, but I think I didn’t flex it enough for the squarish corners in the neckline. I’ll definitely be using that technique again though. This dress was a hot favourite of mine for summer, but I had an incident. With a hot wash. That went unnoticed until after arriving at work. In a very short dress. Yikes. It’s gone unworn for probably two years but no longer! 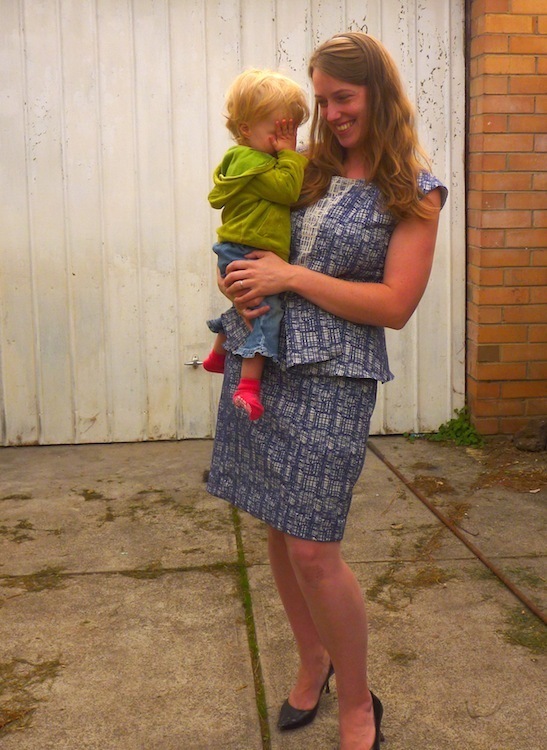 This is a quick post, as it was such a quick fix to make it a wearable top. The details that made this dress so adorable are luckily all bodice details, like the keyhole back, gathered sleeves and cute bust shaping. The only downside is I kind of look like someone has vommed butterflies on me. There are worse problems to have. Step 1. Put dress on. I’m going to head off on a short holiday, so I might hand the baton over to a fabulous guest here later in the week. What do you think? Got anything in your wardrobe that could be easily revived? 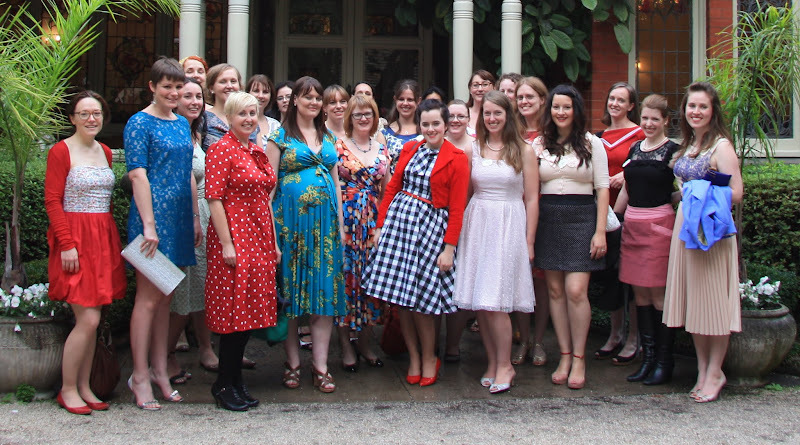 For those in the Northern Hemisphere it’s cooling down, so it’s time to do winter versions of our favourite dresses. While I’m sewing out of season technically, my office at work has some pretty insane AC so it’s always colder in the office in Summer than it is in Winter. Go figure. 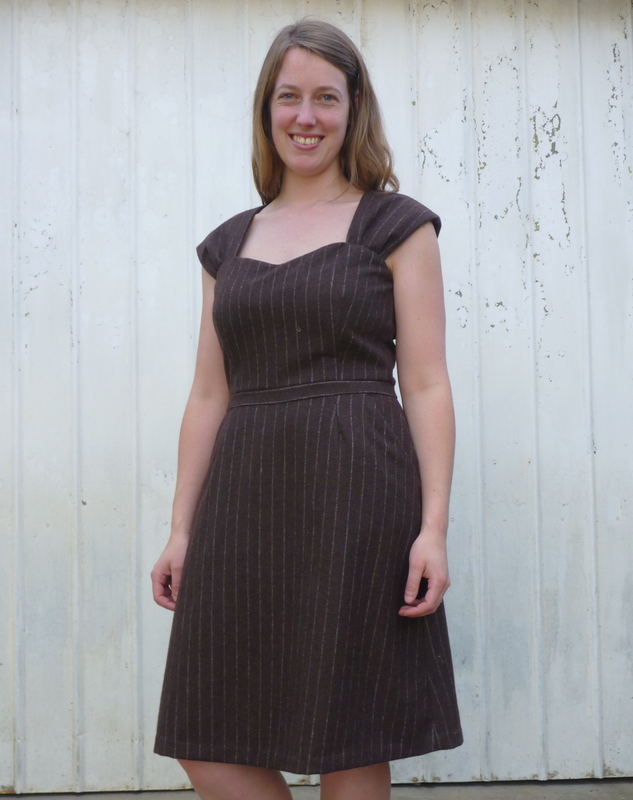 The Winter Cambie is a brown stripe wool, with a black bemsilk lining. I’m really fussy about what fabric I use, as anything slightly coarse or with too much textures gives me a rash. 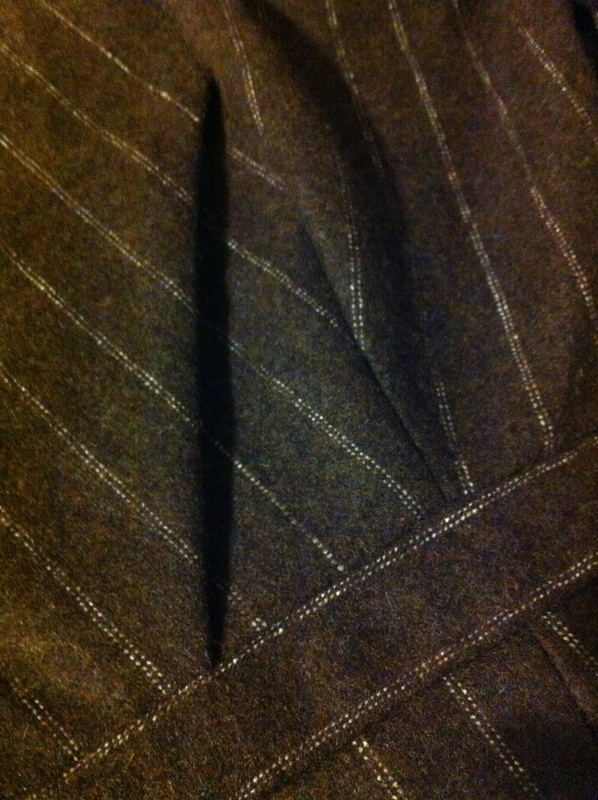 To that end the waistband is not the wool, but also cut from the lining to ensure a nice smooth finish. 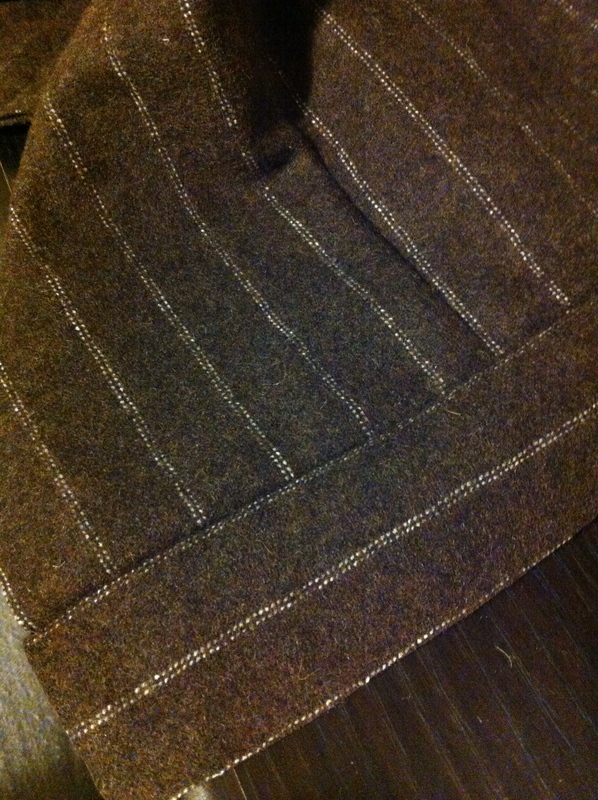 I did cut the waistband very carefully out of the main fabric so the stripe runs straight. 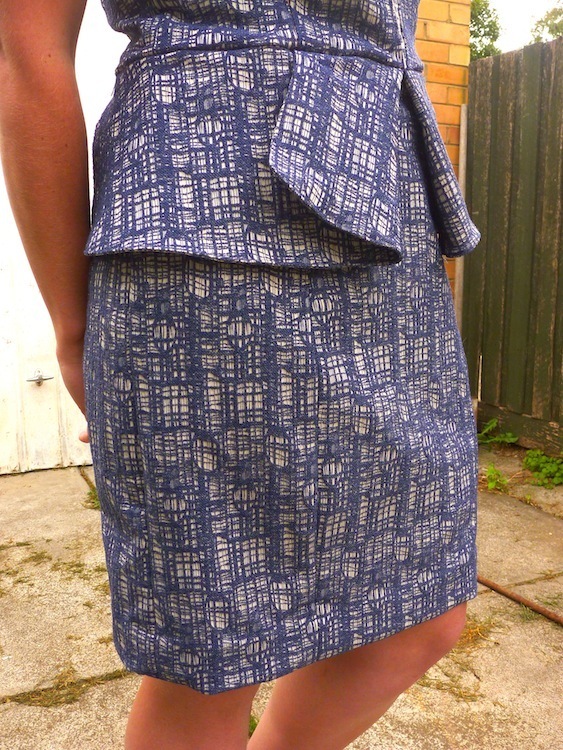 The pockets were carefully cut to match the grain of the skirt, however unless I stitch the pockets shut they won’t look matched. We know they are so that’s all that counts. Pockets are endlessly useful, and why corporate wear designers are of the general opinion that women in the workforce don’t need functional pockets like men is baffling. POCKET SEXISM ENDS HERE. The lining has been prickstitched down, which is a “couture” technique that is really fast, adds a lovely finish and is a perfect job for in front of the teev. Gertie’s New Book for Better Sewing has a great section on how to do prickstitching, and I really can’t recommend it enough for stopping the lining from creeping out of the dress and edges your seamline just to the inside of your dress. The seams were all pinked with only the hems done on my serger and then catch stitched up by hand on the fashion fabric, and just hemmed by machine on the lining. I’m still not very confident with my serger use, and using slippery fabric sometimes it likes to try and eat them, which is counter to what my intention was. The threads also look like the tension on the looper threads is much too loose. If anyone has tried the serger class on Craftsy I’d love to hear your thoughts/review. I’m happy with the fit, I cut a straight size ten and it’s very comfortable. I probably could have cut an 8 through the hips, as the wool doesn’t drape very softly through the hips. Again I had to shorten the straps by nearly two inches, and the only other adjustment I made was the lengthen the pockets. While on paper the size is ok, the way the pocket is angled means it was perfect for phone falling out. I added an inch along the bottom (so the pocket was longer, heading towards my knees) to stop that. Initially I considered making it wider again, but the pocket would then cut across the darts and add too much bulk. It’s a wool from GJ’s Discount Fabrics on Lygon St in Brunswick. It was $12, but actually free as I won a gift voucher 😛 Hooray for free fabric right? The Bemsilk lining is from Spotlight, during one of their sales I just bought 5 metres of it. I hand-basted in the sleeves for a good fit and catch stitched the hem. It’s crazy how fast you start improvising and doing ‘complex’ techniques, as until you try it you won’t realise how EASY it is. The crescent skirt tutorial on how to insert zips is great if you don’t want to use an invisible zipper. 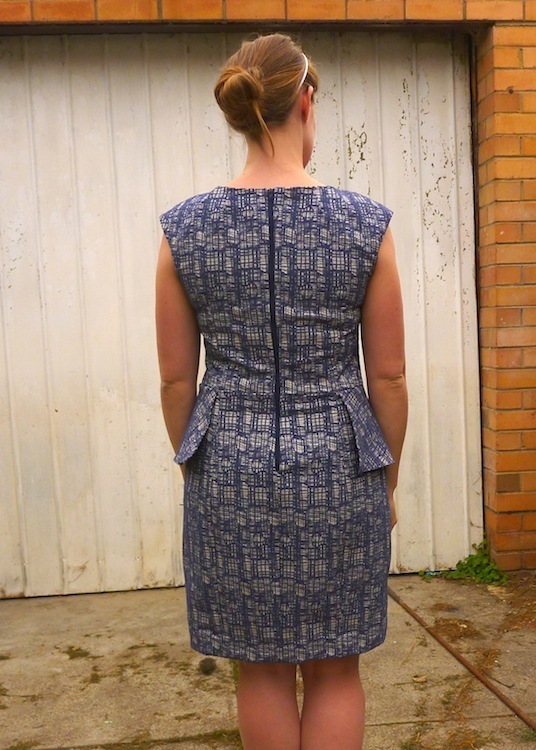 The finish is remarkable, but the tutorial does read complex until you try it, and take your time thinking about which side of the fabric should be where on your finished garment as it applies to your zip. I need to find my zipper foot and learn how to use my serger. I keep cheating on BOTH of these by pinking my seams and using other random machine feet for my singer. What do you think of the winter cambie? I was caught in the rain in it the other day without a coat, it was warm however it’s probably still a little lightweight for snow, but the last time it snowed in Melbourne was 1951. Currently my personal sewing skills are home sewer. What’s home sewer skill level? Home decorating items, simple quilts and limited garment sewing. Often will have a go at sewing most things, but the fit isn’t 100%, or something isn’t quite perfect enough. Instead of trying to smash through all the sewing projects I want to do, with the start of SewSquirrel (I used to blog under Fabricspill), it’s a new era. Take more time, blog about the progress, but most importantly is this. If I wouldn’t buy it, I didn’t make it well enough. The reason for sewing for other people (i.e. quilts) is to make something beautiful, personal and crafted just for them. Generally as a personal rule, hand quilted is better than machine JUST because they are softer and more snuggly. Back to hand quilting, except for baby quilts. Babies grow to fast to wait for hand quilting. And they vomit more than normal people, therefore baby quilts NEED to be more hard wearing, and the parents happy to throw it on the floor. Garment sewing is to create a well fitted beautiful piece of clothing I love. This dress here is always covered with a cardigan as the shoulders slide down and show the bra straps. Why bother making it then? The wardrobe is going under assessment. What do I wear the most? In what fabrics? Then I’m planning a wardrobe, and starting with the beginner patterns I’m going to make them again. And then skill up. And learn how to fit a pattern properly rather than quick fixes. If you’re interested in joining me on this adventure, open up your closet doors and let’s talk.